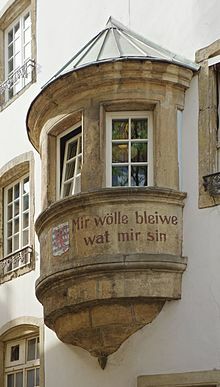 Mir wëlle bleiwe wat mir sinn ([miːə̯ ˈvələ ˈblɑɪ̯və vɑt miːə̯ ˈzin]; Luxembourgish for "We will stay what we are"; archaic spelling Mir wölle bleiwe wat mir sin) is the national motto of Luxembourg. The national motto is also translated into the other two official languages, French and German, although they do not have the status of a national language: "Nous voulons rester ce que nous sommes" (French) and "Wir wollen bleiben, was wir sind" (German). It refers to the ambition of the Luxembourgish people to remain separate from, and independent of, those neighbouring countries around it that have traditionally tried to dominate it politically, economically as well as militarily and, as final goal, to annex it: Belgium, France and Germany (Prussia before the first German unification of 1870–71). We will stay what we are. ^ "Do you know Luxembourg's national anthem?". Luxemburger Wort. June 23, 2013. The franc (₣) is the name of several currency units. The French franc was the currency of France until the euro was adopted in 1999. The Swiss franc is a major world currency today due to the prominence of Swiss financial institutions. The name is said to derive from the Latin inscription francorum rex used on early French coins and until the 18th century, or from the French franc, meaning "frank". Luxembourgish, Luxemburgish, Letzeburgesch, or Luxembourgian is a West Germanic language that is spoken mainly in Luxembourg. About 390,000 people speak Luxembourgish worldwide. "Ons Heemecht" is the national anthem of Luxembourg. The title in Luxembourgish translates as "Our Homeland". Michel Lentz wrote the words in 1859, and they were set to music by Jean Antoine Zinnen in 1864. The song was first performed in public in Ettelbruck, a town at the confluence of the Alzette and Sauer rivers on 5 June 1864. Luxembourgers are a Germanic ethnic group native to Luxembourg who share the culture of Luxembourg, speak Luxembourgish and are of Luxembourgish descent. Camillo Jean Nicolas Felgen was a Luxembourgish singer, lyricist, disc jockey, and television presenter. There are a number of national symbols of Luxembourg, representing Luxembourg or its people in either official or unofficial capacities. Luxembourgish nationality law is ruled by the Constitution of Luxembourg. The Grand Duchy of Luxembourg is a member state of the European Union and, therefore, its citizens are also EU citizens. The Place d'Armes is a square in Luxembourg City in the south of the Grand Duchy of Luxembourg. Centrally placed in the old town, it attracts large numbers of locals and visitors, especially in the summer months. It originally served as a parade ground for the troops defending the city.